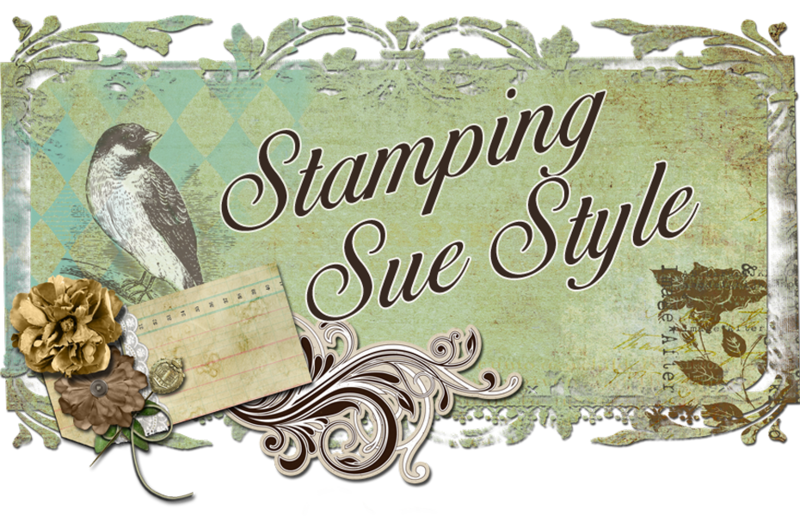 Stamping Sue Style: Make it a trio ! Make it a trio ! 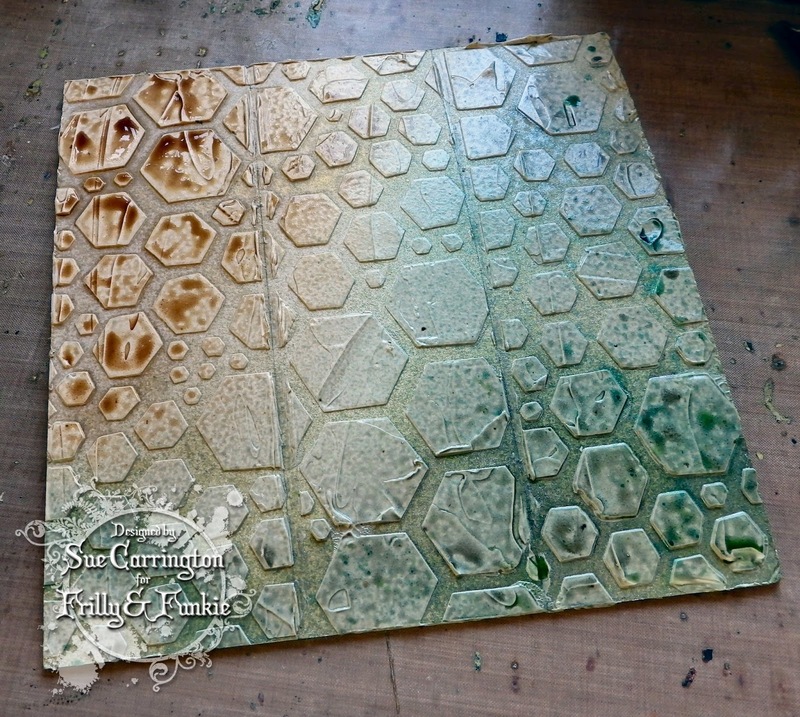 It's the start of the second week of the current challenge over at Frilly and Funkie. I'm the host for this challenge and I chose 'Make it a trio'. 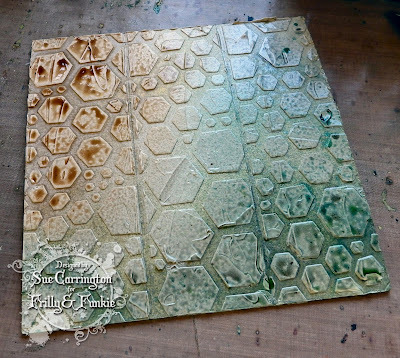 One of the things I love to do is work in 3's on a project, 3 tags, 3 panels, 3 arches etc.... so for this challenge I'd like to see projects including 3 of something, and this does need to be the main focal point of your project. 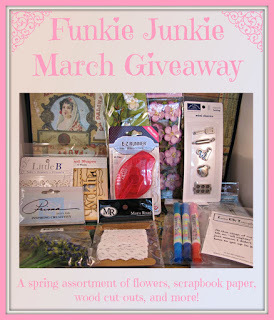 Before we get into the nitty gritty of my project I need to share a fabulous giveaway from The Funkie Junkie Boutique ! Just click on the picture for more information. So, now back to the order of the day ! I started with a piece of greyboard that is covered with white card. 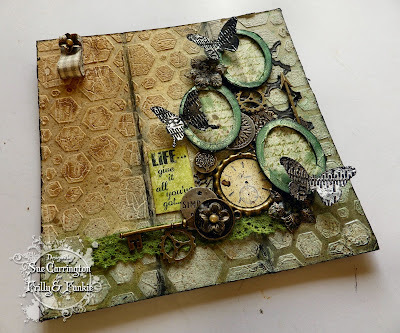 I used the Dylusions stencil with Wendy Vecchi's Crackle Paste. While it was still wet I dragged a ruler through the paste to create 3 panels and then spritzed the whole thing with Lindy's Stamp Gang sprays. 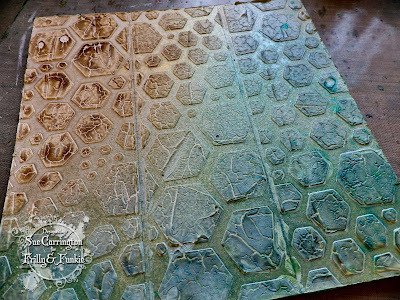 When the paste dried it created these wonderful white cracks and the sprays blended together beautifully. To created the main focal trio I used these 3 wooden ovals that have been in my stash for years ! I spread Wendy's Crackle Paste over them then spritzed them with a Lindy's Stamp Gang spray. When everything was dry I dabbed Little Black Dress Fresco Finish paint around the edges. 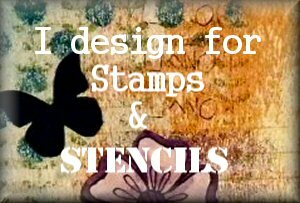 I used the Wendy Vecchi Script background stamp with Fern Archival ink and stamped onto a piece of newsprint paper. Sorry I didn't take a photo of this stage ! 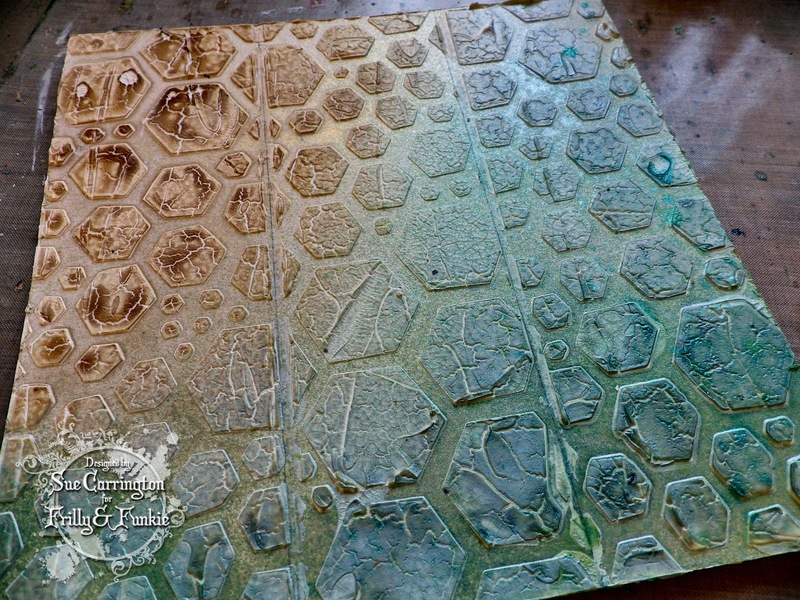 I'd got lots of metal embellishments on my table, the reason why will become clear on Friday ! So, I grabbed a few and started to place them until I finally was happy with the layout. 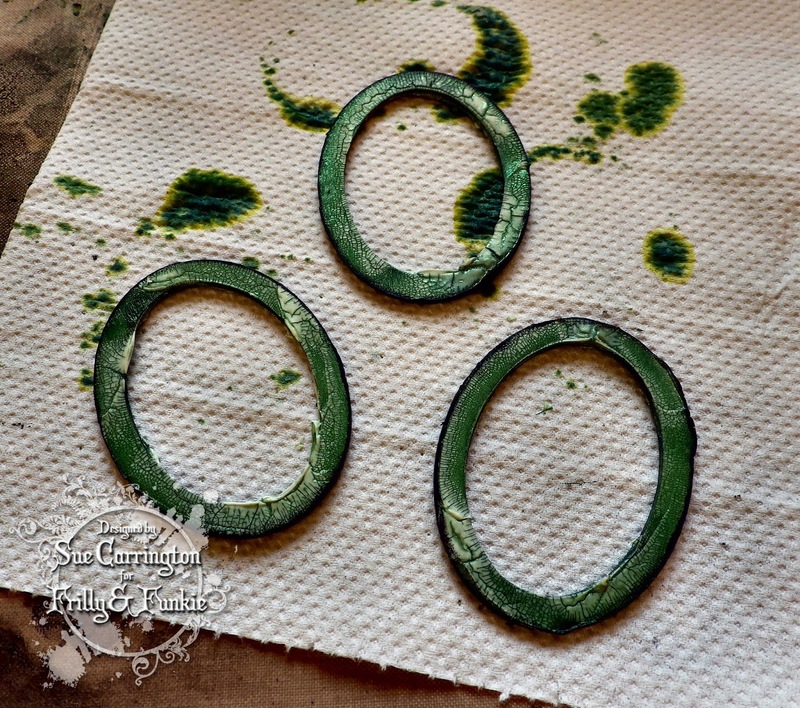 The lace was spritzed with a Lindy's Stamp Gang spray and I love the pop of green ! The 3 butterflies are die cut from aluminium metal that's been embossed using the Tim Holtz Tape Measure embossing folder. I've then dabbed them with Little Black Dress Fresco Finish. The lattice is also die cut from aluminium metal and I've given it the Little Black Dress treatment too. A Wendy Vecchi sentiment fitted the bill for this project and nestled quite nicely in the space I wanted it for. I used a black Stabilo pencil to add some shading to the 2 vertical lines in the embossing paste and to finish I spritzed the whole thing with some more Lindy's Stamp Gang spray and dabbed Litltle Black Dress around the edges. Sue, this is just fabulous!!! What a great take on the theme. Your background is stunning and the detail in the oval frames and butterflies is tremendous. Awesome! Gorgeous! 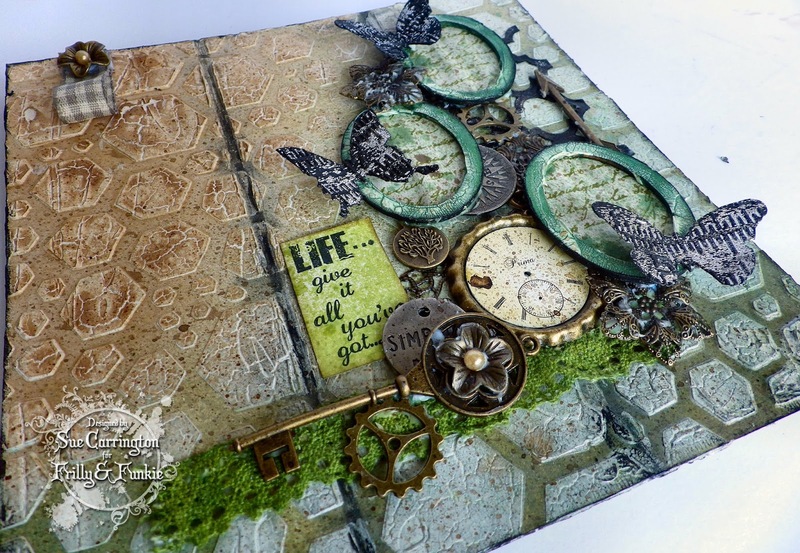 I love the crackle paste background and the sweet colors blended into the background! Fabulous ovals and layers! 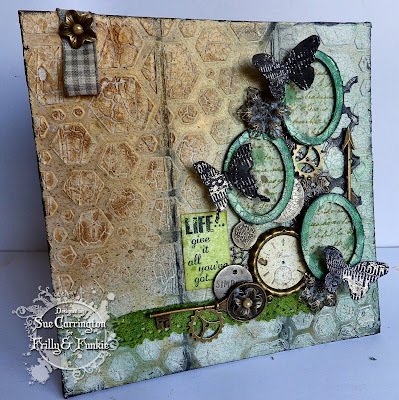 I love how you embossed the butterflys! Great project. Wow! This is fabulous, Sue! I love the texture and layering. It's always a pleasure to take in your process. I'm pinning this now! Oh, this makes my heart sing! That background alone is wonderful, with all it's fabulous texture and inky goodness. But then you stacked up layers of goodness on top of that, and my heart goes pitty pat! It's superb! 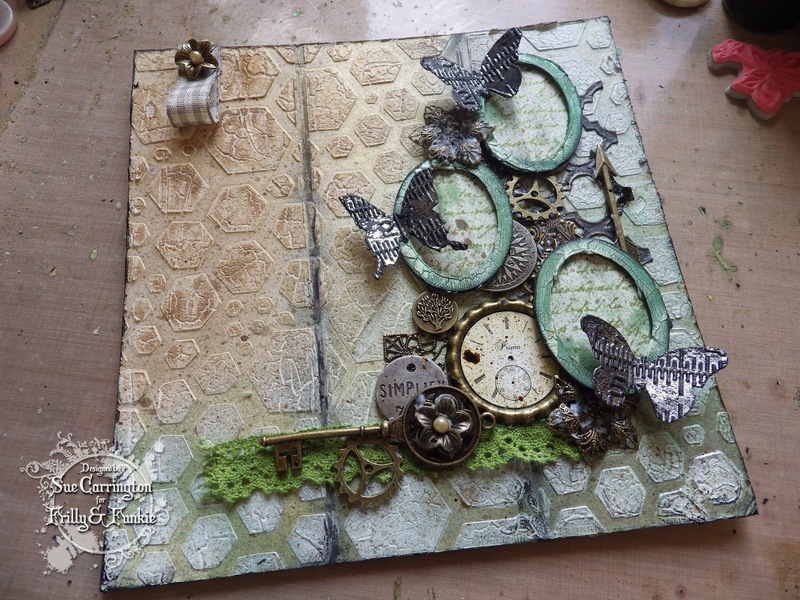 Gloriously textured panels - the colours are simply beautiful and the collaged embellishments are pure perfection. Stunning! This is lovely! The blending of color and texture is really nice, love that pop of green and really love all of the metal touches. Hip to be square ! A little bit of wax and a long week !